Looking for Service on Your Air Conditioning in Galena, Kansas? Central air conditioning (AC) improves our quality of life so much that many people cannot imagine life without it. Since Willis Carrier invented the first electrical AC unit in 1902, the technology that is used to efficiently cool homes and commercial buildings has improved exponentially. Barone's Heat & Air, LLC is an established HVAC contractor in Galena and air conditioner installation and repair is our specialty. We offer the very latest in AC systems. Our certified technicians perform regular maintenance and repairs on AC units in Galena to keep you comfortable during the summer’s hottest days. Contact us at (417) 232-0017 for all of your AC needs. AC systems come in several designs. When you’re building a new structure or replacing a worn out system, you must consider which size and type of system is right for your space and usage requirements. Split, Packaged, and Ductless Mini-Split Systems are some common air conditioners in Galena available for residential and commercial buildings. You’re probably most familiar with the Split system that consists of an evaporator coil that is located inside your home and a condenser coil and compressor that sit outside. Barone's Heat & Air, LLC installs split ac units in Galena that minimize indoor leaks and reduce outdoor noise. If your home or office doesn’t have duct work, we can introduce you to the advantages and drawbacks of Ductless Mini-Split Systems. Call (417) 232-0017 for more information. Most industry experts agree that early spring is the best season to schedule an annual check up of your AC system in Galena. It’s definitely a good idea to find out if you need system repairs before summer temperatures begin to soar. Barone's Heat & Air, LLC routinely checks refrigerant levels and tests for coolant leaks. We inspect ductwork for leaks and seal them to improve your system’s efficiency. Our technicians also tighten electrical connections and lubricate motors and belts. Call us today at (417) 232-0017 to schedule maintenance of your Galena AC system to avoid costly repair bills in the future. 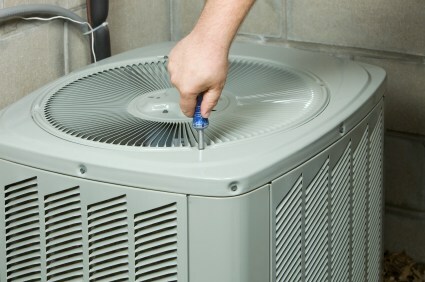 Barone's Heat & Air, LLC has been repairing all types of HVAC systems in Galena with precision since 2009 . We use the latest tools to accurately assess AC problems, and our time-tested repair techniques ensure that your unit performs like new. When your AC in Galena is not blowing cold air, call the local HVAC contractor that has 10 years of experience bringing old systems back to life. Contact us at (417) 232-0017 for a free quote. Affordable Rates - Servicing Galena air conditioners since 2009, Barone's Heat & Air, LLC provides reliable, on time service at competitive prices you can afford. From after-hours emergency service to regular maintenance and initial installation, our rates are always fair and reasonable. Satisfaction Guaranteed - Barone's Heat & Air, LLC works hard to earn the loyalty of our customers, and places your comfort and safety above all else. Your satisfaction is our top priority, and we will work hard to ensure your cooling system in Galena works dependably. Dedicated Customer Service - The staff at Barone's Heat & Air, LLC are available to serve you at any time. When an emergency hits in the middle of a summer heat wave and your air conditioning system goes on the blink, Barone's Heat & Air, LLC has trained technicians ready to help. Trust your air conditioning systems to Barone's Heat & Air, LLC, where affordable rates, dependable customer service and a satisfaction guarantee ensure your cooling equipment is well taken care of. Call Barone's Heat & Air, LLC at (417) 232-0017 today for a quote on Galena air conditioner installation and service.